Saving our seas - What else can we do? 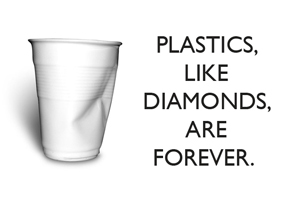 Every year, about 300 billion pounds of plastic is produced around the world, and only a fraction is recycled. We’re all responsible for this mess, and it will take all of us to stop it from getting worse. It’s time to completely rethink how we as a society use (or abuse) plastic. Reduce, repair, re-use and re-cycle – be conscious of all that you buy, and be sure to avoid ‘disposable’ plastic products and anything with excessive packaging. Plastics are highly dependent on oil for their production - start treating plastics as the rare resource that they soon will be! Refuse plastic carrier bags wherever possible - try always to carry an alternative with you. Avoid buying takeaway drinks in plastic bottles and cups. Carry a re-usable container if you can. Don't buy products containing microbeads. These are present in many toiletries products but also in household cleaners and detergents. Keep a watchful eye on ingredients lists and boycott the culprits! Don't take part in balloon releases and never let go! Never flush plastics (sanitary towels, tampon applicators, cottonbuds) down the loo - and don’t use tampon brands with plastic applicators. Demand more and better recycling facilities in your area - out and about, not just in the home. Take part in river and beach clean-ups (for instance, Beachwatch) - or organise one yourself. Every time you see litter, pick it up and dispose of it properly. When visiting beaches, take a spare bag to pick up any litter that you see. If you live near the sea or a river, your storm drains may be washing rubbish out to sea. Demand that these are eliminated. Support organisations such as Greenpeace and the MCS, who are lobbying for better protection of our oceans and wildlife. Be very conscious of your ecological footprint. Encourage change though your decisions and do not accept society's obsession with consumption and disposability. Finally, why not start your own campaign at your local school or library - ‘Plastic Fantastic?’ posters are available on my website www.flyintheface.com and lots of useful links for further information. Do email me and let me know how you get on!